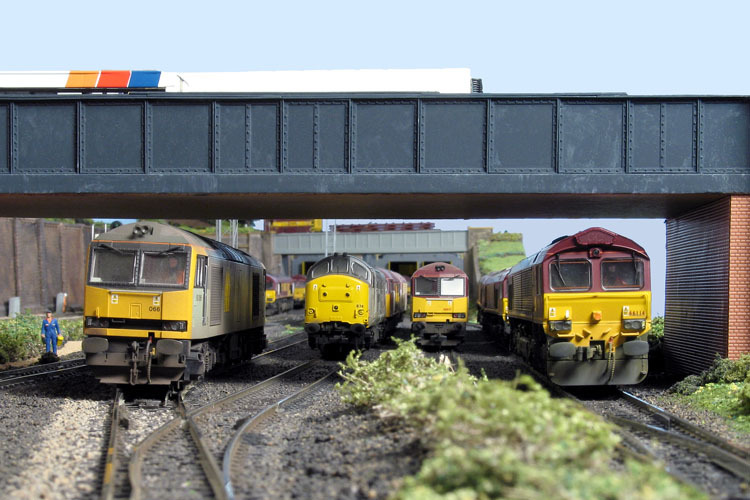 Images in the above display are Courtesy of Ian Manderson, Railway Modeller. I came back into railway modelling after a 20 year break. When starting, I decided to get back into the hobby with N Gauge but found it too small. I then decided where would I construct this layout? The answer was in my garage which determined the size of the layout and that it would be an “end to end” layout. Once started, I realised that it was too cold to work in during the winter so I had it converted into a hobby room. 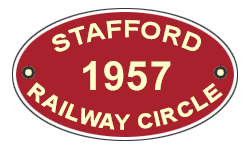 The plus of this is the fact it is fully heated which has caused some comments at “Stafford Railway Circle” as most members work in either a garden shed or garage. This enables me to work on the layout whatever the weather is outside. Living in rural Staffordshire I travel daily into Birmingham New Street on the Cross City Line. This line passed the former wagon works at “Duddeston” where I would still sample a variety of 08 shunters which had come in from “Bescot Yard”. However, sometimes I would travel in across “Cannock Chase” and then pass “Bescot Depot”. Seeing rows of redundant and working EWS loco’s in all type’s and liveries, this gave me the idea for the layout – a working depo,t not based on any existing depot, but to my own design to fit in the space available. Being a bit of a gadgets man I decided to go digital and the thought of all those section switches on this type of layout and the size of the control panel pushed me digital. 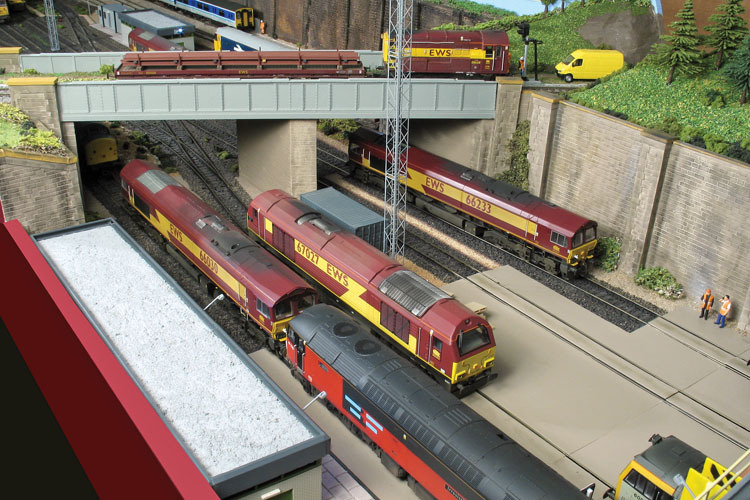 DCC was a new self learning curve for me as no-one in my railway club had modelled in digital before. With the points, I did not want to use manual point rodding and right from the start used digital electric point motors. Once completed came the task of ballasting – again, a long task in view of all the track work. To get a variety of colour ballast I have mixed many different colours and sizes to achieve a good result. 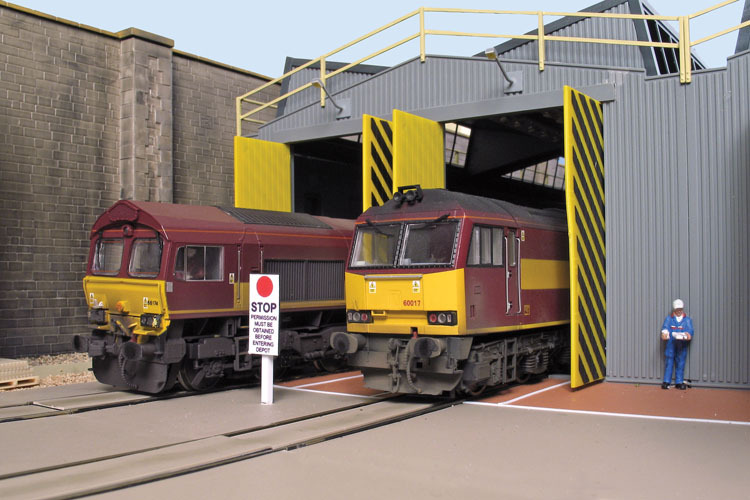 Main depot building is four Peco kits and I also used their inspections pits, of which two pits have white LED’s incorporated into the side. The Depot flooring is made up from layers of plasticard in different colours. The lights around the depot are all fully working. 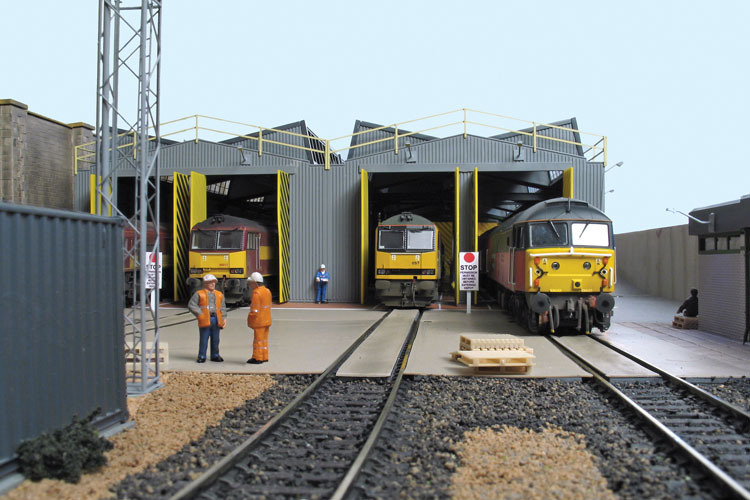 Plus, I have placed various model people to reflect a working depot. Looking at the layout from the front I wanted to split it into 3 areas “The Depot”, ”The storage siding” and the “Fuelling point /Head shunt”. I decided to build two bridges, a road, and goods only railway line. Both give the desired effect. Both are hand built using various plastic accessories to achieve the result. Retaining wall along the back of the fuelling point and the main running track is from “Ten Commandments” weathered again to give a typical dirty look. With the main area used for the depot there is little grassland but it has been created using a variety of colours and textures. Locomotive stock is all the classes you would expect to see at the turn of the millennium. This started off as problem when I began the layout. The only suitable loco’s where either Lima or dated Hornby stock. Both required attention to detail to improve their appearance and performance. Then, by luck or fortune, Bachmann released the Class 37, soon after came the Class 66 and from there on new locos appeared in various liveries. The problem I had is that I needed more than five EWS Class 66s so I asked “Interespray” if they could come to my assistance in renumbering the locos. Now I have twenty plus EWS 66s. This just did not stop with “Sheds”; I needed to increase my stock of other class locos too. I completed the renumbering of Hornby Class 60s (“Tugs”) and 56s (Grids) myself. But with 37s, 47s & 58s and any other loco that required a re-spray to achieve the correct livery I am pleased to say that Steve at “Geoffrey Allison” assisted me as well as “Interespray”. At present I now have in excess of 100 locos that were around at the turn of the millennium up to 2003. 70 plus of these locos are fully chipped and, with the majority, I use various Lenz decoders. With some “Sheds” I have gone further and replaced all the wiring in the loco with my own design that gives additional lights in the cabs. 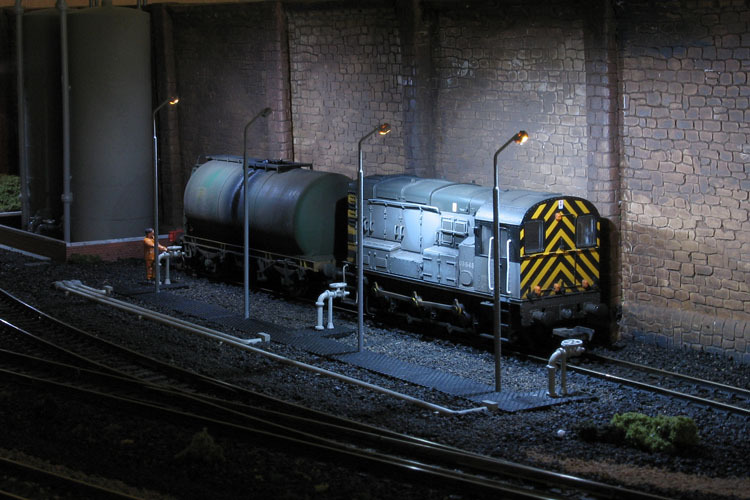 Also some of the “Tugs” have “Model Express” revised lighting kits. All the locos have been weathered by myself to various levels of dirt, and include oil stains that you would see the on a loco. 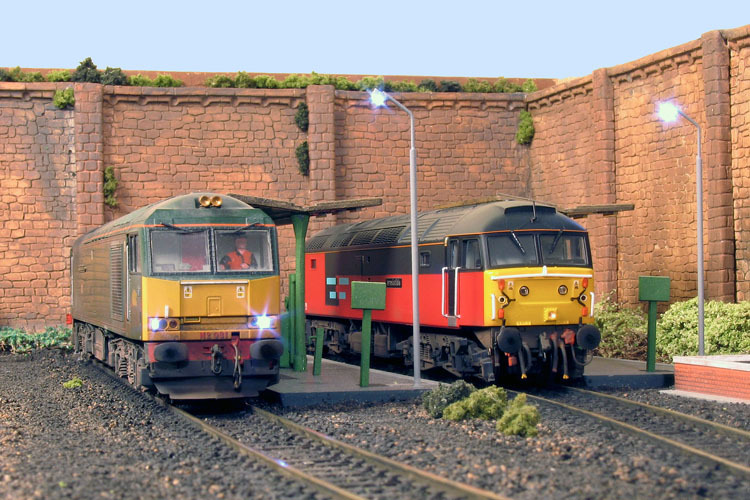 Other stock on the layout includes various DMUs and other rolling stock passing through on the main lines. Finally where did the name for the layout come from? The answer is the predominant colour of the locos on the layout and just added “road” to the end to give “Crimson Road”. – with wing 242cm x 200cm. Any Crimson Road exhibition bookings are shown in our Events Calendar page.